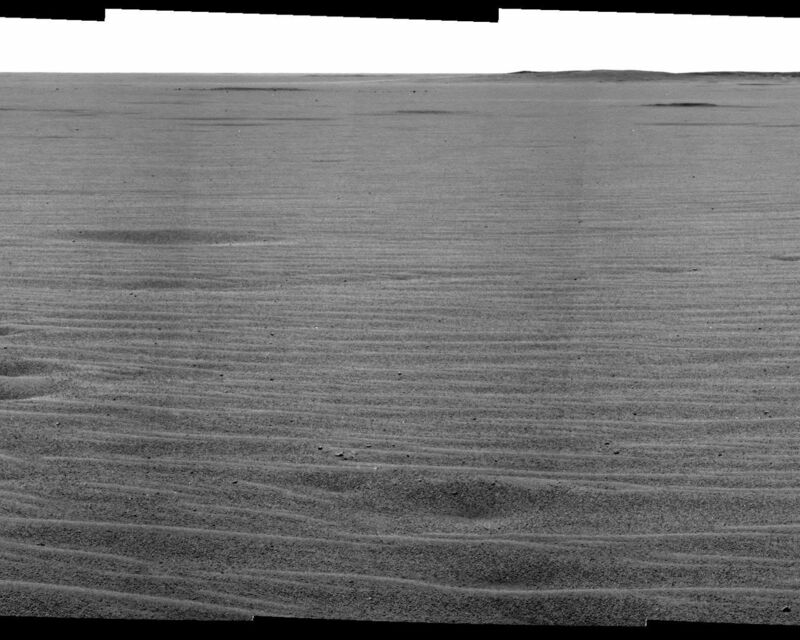 This mosaic image from the Mars Exploration Rover Opportunity's panoramic camera provides an overview of the rover's drive direction toward "Endurance Crater," which is in the upper right corner of image. 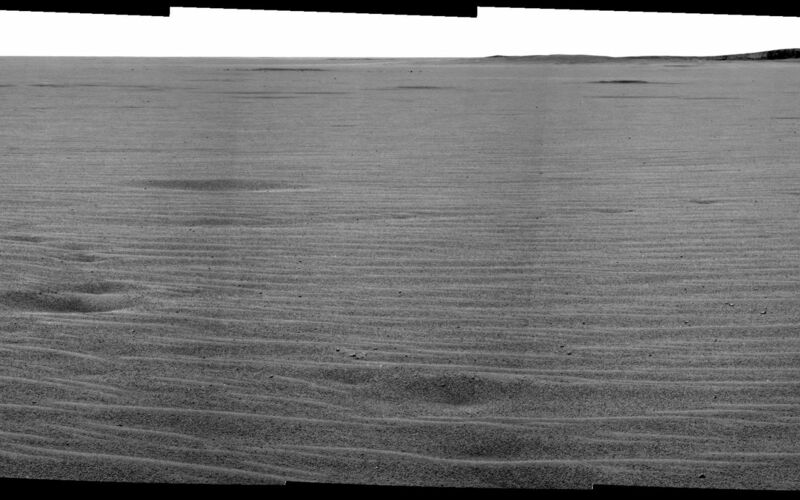 The plains appear to be uniform in character from the rovers current position all the way to Endurance Crater. Granules of various sizes blanket the plains. Spherical granules fancifully called blueberries are present some intact and some broken. Larger granules pave the surface, while smaller grains, including broken blueberries, form small dunes. 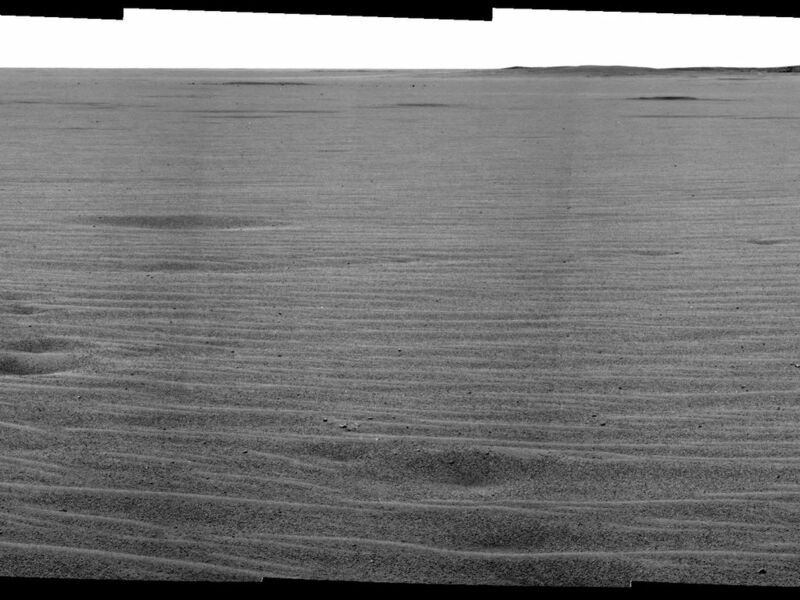 Randomly distributed 1-centimeter (0.4 inch) sized pebbles (as seen just left of center in the foreground of the image) make up a third type of feature on the plains. The pebbles' composition remains to be determined. Scientists plan to examine these in the coming sols. Examination of this part of Mars by NASA's Mars Global Surveyor orbiter revealed the presence of hematite, which led NASA to choose Meridiani Planum as Opportunity's landing site. The rover science conducted on the plains of Meridiani Planum serves to integrate what the rovers are seeing on the ground with what orbital data have shown. Opportunity will make stop at a small crater called "Fram" (seen in the upper left, with relatively large rocks nearby) before heading to the rim of Endurance Crater.